I've been planning to improve on my current etching solution (namely, waving PCBs around in a bowl of ferric chloride for ten minutes) and the easiest route seemed to be a bubble etch tank. Put simply, this is a tank containing etchant, some sort of aeration device, usually a heater of some description and some plastic to suspend the PCBs. In my case, I went for a plastic tank from Tescos that looked a useful size, a fishtank air pump and heater on the cheap from eBay, and some of this "clear etchant" from Rapid. It has a piece of plastic with large holes in from a 99p peg basket from Tescos, and some more holes drilled in that. 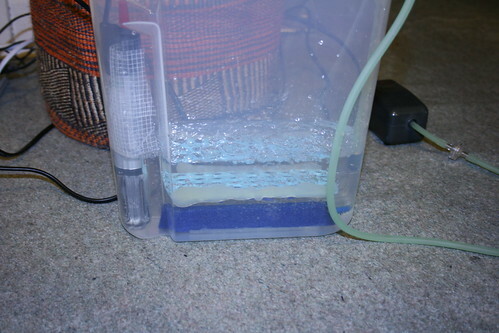 The blue stone at the bottom is an airstone, it's connected up to the fish tank air pump and the heater is held in place by tape on the side. Right now it's just full of water. 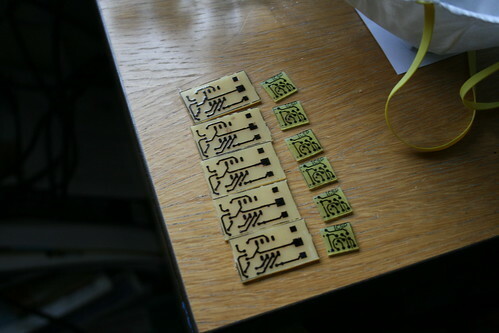 I got some PCBs ready for it the next day and tried out etching them. This is where I ran into some difficulties. First, the plastic didn't work perfectly to keep things from slipping to the bottom, a problem that should be easy to remedy with some bits of plastic at the edges. Second, the holes really don't work out when the PCB is lying flat - you end up with circles where it is etched and the rest of it is still copper. A slanted piece of plastic may help with this, or a bent piece of flexible plastic so that the entire PCB is covered in the etchant. The heater wasn't really the right tool for the job - it didn't seem to measure the temperature right, possibly because of how much it was submerged, which meant that it kept turning off. Even when on, however, it did not manage to warm the etchant up much. A small immersion heater may do a better job of this, since the hotter the etchant is, the better. The air pump did work fairly well, although a more poweful one may have gotten more bubbles over the entire length of the air stone. They came out fairly nicely, so no complaints there. The clear etchant has since turned a nice blue, which is somewhat interesting. I'll be sure to update when I've got the new design working, because it still has the potential to be a lot better than doing it the old way.